Fluid seals are available in three styles, single acting (SAF), double acting with a locking wear ring (DAF W style) and double acting with a loose wear ring (DAF L/W). The single acting fluid seal can work both as a piston or rod seal. The single acting fluid seals standard material is a Nitrile sealing element with a fabric reinforced base. Corresponding wear rings are sold separately. For dimension information of single acting fluid seals with a wear ring please contact Hi-Tech Seals. Our double acting fluid seals are designed for use on split pistons. 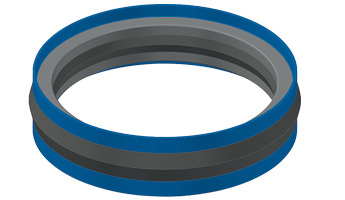 Double acting fluid seals are composed of a Nitrile sealing element, fabric reinforced base and two Acetal wear rings. * For Single Acting Wear Ring (WR) part numbers, refer to Single Acting.